The funfair, popularly known in Pamplona as "Las Barracas" (fairground stalls) is generally located in the park of La Ruña in the district of La Rochapea, just below the city ramparts. The traditional Barracas remain open practically 24 hours a day and are one of the star attractions for adults and children alike. The fair features close on one hundred attractions which are installed each year for the San Fermin fiestas, ranging from the traditional shooting range, children's merry go rounds, bumper cars, big wheel, horse carousel, tombola, etc. to new rides developed around the latest technology. Apart from the rides and attractions, there are also food stalls such as Churrerías, selling long, fried doughnuts and hot chocolate, and bar and restaurant vans serving a range of sandwiches, omelettes and other dishes. The fair generally becomes packed in the late evening, particularly just before the Firework display. The fairground has become a meeting point for groups of friends, as it is centrally located. Before going to the fair, it's a good idea to plan how much you would actually like to spend, as it's very easy to go over your budget. 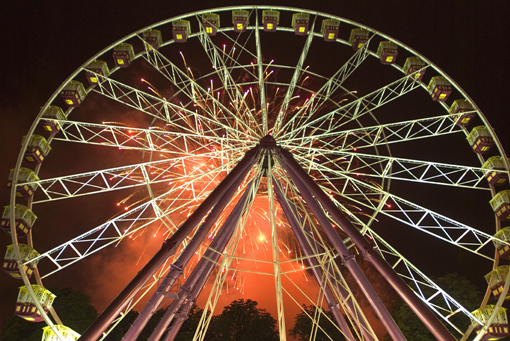 On the 15th July, the day after the fiestas and the final day of the fair, the price of the rides is reduced. You should also keep an eye on your bag - it's easy for thefts to occur amongst the crowds. An international circus traditionally comes to Pamplona during the fiestas, located as close as possible to the Barracas.